Author Hans Limmer was born in 1926 but in 1960 he emigrated with his family to Greece where he lived on the island of Rhodes where this hardback picture book is set. The story is of Angelika who lives on Rhodes with her parents and sister Susi (who owns Benjamin the donkey, another charming tale by Limmer). A blonde-haired toddler, Angelika loves roaming the Mediterranean island with her favourite doll, Hippi. 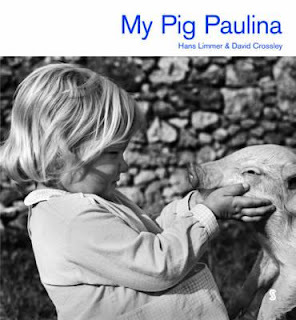 When she adopts a piglet named Paulina she finds in a small sack near the road, the two have lots of fun together. We see Paulina’s small pen, the pig rolling in mud (Angelika muddy, too), and Angelika on a trike, pulling Paulina along in a cardboard box. The little girl also dresses her pig in striped underpants. Illustrated by president of the Houston Centre for Photography, David Crossley, there are numerous engaging photos such as the small girl and her pig friend are nose to snout, the two are racing through a field of flowers and chubby-faced Angelika lifting Paulina up from the cobblestones. Like its companion classic bestseller book, My Donkey Benjamin, this is a picture book with compelling, naturalist photographs, sure to entertain and amuse children aged 5 to 7 years.